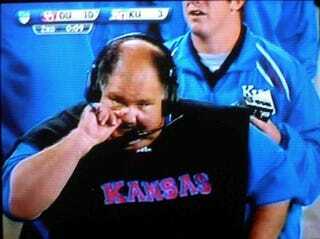 We don't know about you, but we're entranced by Kansas coach Mark Mangino. He's like Rick Majerus, but less cartoonish. He looks like what we want football coaches to look like; sorry, ladies, but he's married! Anyway, Kansas is still undefeated and could legitimately be in the BCS title game. Our minds are blown, and we desperately want to see this happen. In honor of our favorite non-water-skiing head coach, after the jump, our favorite photos of our man Mangino. You know, for all the ladies out there.